It's true that Samsung has already set up Galaxy S9/S9+ promotion studios where people can come and try out its new flagships before buying one, but these are hardly available everywhere across the globe. On top of that, you might not be able to head to one of these promotion studios, or don't have time. So, the South Korean company thought it would be best to give consumers interested to buy the Galaxy S9 or S9+ the option to try out some of their features directly on their phones. 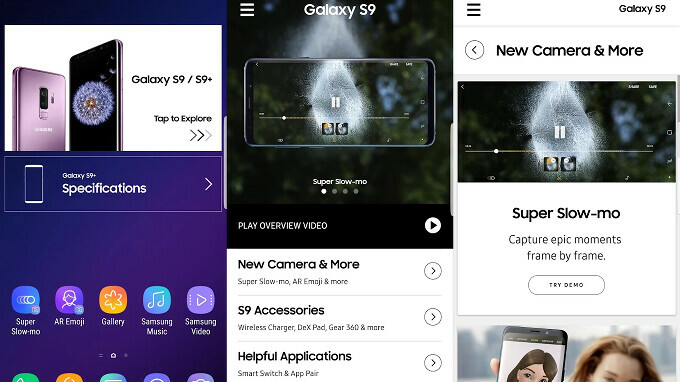 The new Experience app for Galaxy S9/S9+ offers exactly what it says: a virtual experience of what these two phones can do. The app comes with some videos that further explain some of the most important features the flagships have to offer. You'll be getting important information about the S9/S9+ in terms of camera, accessories, helpful apps, and device specifications. These sections are accessible from within the Android app and should give you an idea of what the smartphones can do and if they suit your needs. More importantly, the application is said to be compatible with all devices running Android 6.0 Marshmallow and up, so there's quite a large pool of consumers who might want to give it a go. It’s too bad an iOS version of the app can’t happen, the S9 could potentially sway some iPhone users.